I am sorry to say that the tip that came to me about the Municipality of Highlands East was not correct. I don’t think that the tipper meant any malice but they were simply misinformed and I passed on this misinformation to you. I am very sorry about this. I know it must have been a sad disappointment for at least one of the people who read it, because Dan wrote to the the Municipality of Highlands East and here is the note that he got back. I am sorry Dan and others who hoped to make this community their home. 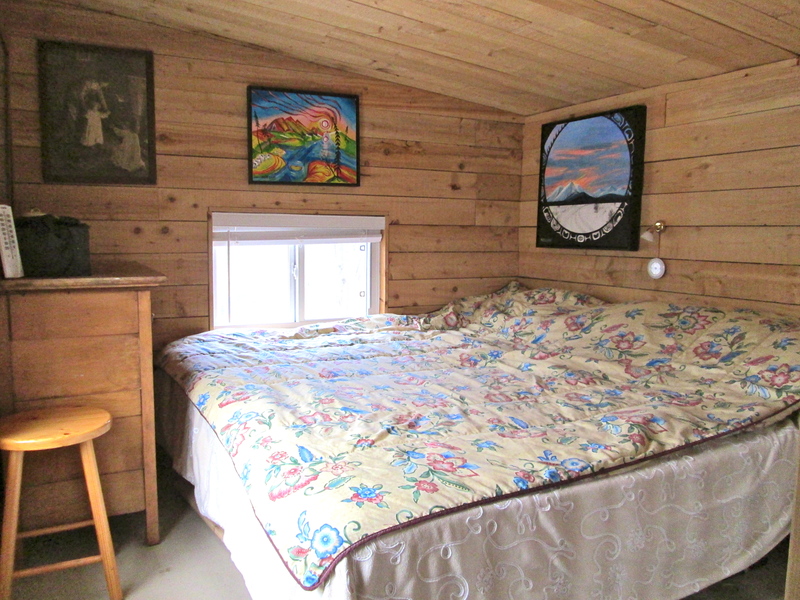 There are two bits of news that I find promising when it comes to the legality of tiny houses in Ontario. 2. UPDATE: the Municipality of Highlands East has lowered its footprint size to 500 feet. Which is a perfectly reasonable house size and right sized for a lot of people. (News of this came to me on November 19, 2015) One tiny step forward! 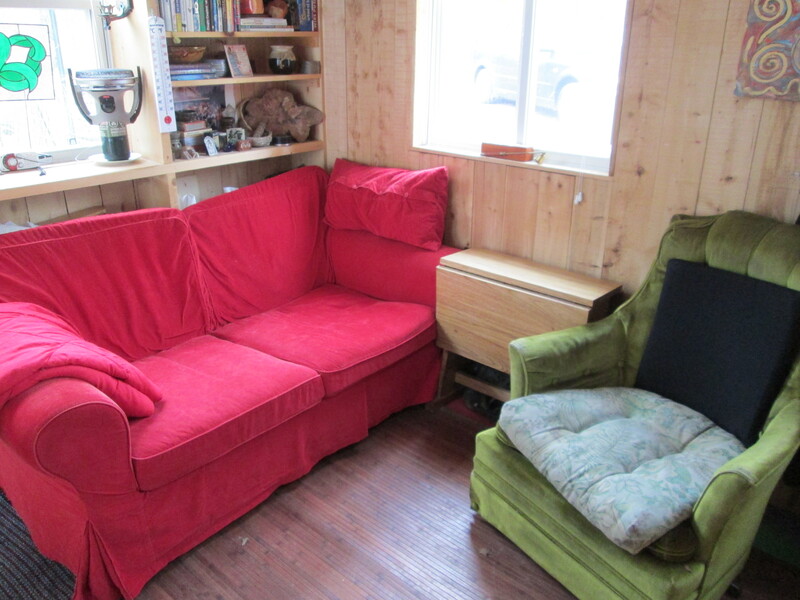 Tiny house hopeful Anthony shared a bunch of research that he has been doing in his area. He discovered that Garden Suites are allowed to be built in the area outlined in black in the below map of Ontario. Each of these areas has rules unique to its own area. But essentially what holds true to all of them is that if you can get someone to agree to allow you on their land, if you hook up your services to the main house and if you pay a nice hefty fee, you can park a tiny house in these areas. Yes I said PARK! These buildings must be supplementary and they must be mobile. With this said, please before you jump check the specific area, there are a lot of restrictions and you will need to know these. You can’t fill too much of the green space in a lot for example and wouldn’t it be a pity to build a house 1 square foot too big after paying for all the hookups. Also doing this will NOT be cheap. These houses MUST be hooked in on the existing infrastructure. No off grid toilets, there must be running water and electricity. In other words, if you are considering building you have to add all of these infrastructural costs to your build. Further to this, you better have a LONG term lease with the land owner, even if this is someone you trust. Once you spend the money for hooking your house to sewage, water and electricity you want to be sure that a fight over a cup of sugar won’t find you and your house without a place to live. I want to note that while I am excited about the potential of this, there is a lot of leg work and money to make this happen. If you decide to go ahead with doing this, please do so with your building inspector as well as a lawyer to draw up a lease agreement. Remember I know something about tiny houses, but I am not willing to take any responsibility if you fail to do your own homework for your own house. I can’t possibly know all the individual codes for every township. The second point, and this is REALLY great news, just last night I heard from a counsellor from a very nice area in Ontario. This person said that they are considering removing the minimum house size in the area that they are representing. I sent back SO much information that they will have to spend quite some time reading the information I sent. This said, it is totally worth my time to donate my time to this cause, because I want to ensure that tiny and small sustainable homes are available to anyone who wants to live this lifestyle. When I know more, I will certainly share more. We are getting closer every single day folks! I had an MPAC person stop by my project, Tiny House Ontario a few days ago. If you don’t know, these are the tax assessors that ensure that the people of Ontario pay their fair share of taxes. I am not opposed to paying my fair share of tax, what I oppose is the way that building codes do not allow people to build as they wish. I absolutely understand and agree that they need to be put in place so that people don’t just build unsafe, cardboard dwellings in which they, their family and guests could easily burn to death. What I don’t get is the part where we all have to build 2400 square foot McMansions which are totally disconnected from the planet around them. I don’t get why I should have to worry about my tiny house being somehow unlawful. It seems every new house I pass is not facing in the right direction to benefit from the sun and wind. There is no effort for these homes to be environmental except of course, the compulsory level of insulation. The codes need to be revisited, deconstructed and rewritten in order to reflect a more modern age in building technology and realistic resource consumption. At the very least, in a country were the seasons change passive solar should be considered in every single new structure that is built. Too size limits need to drastically decrease, both in terms of lot size and the footprint of these homes. I took all this into my mind and more, and believe me THO has as tiny a carbon footprint as she does a physical one! 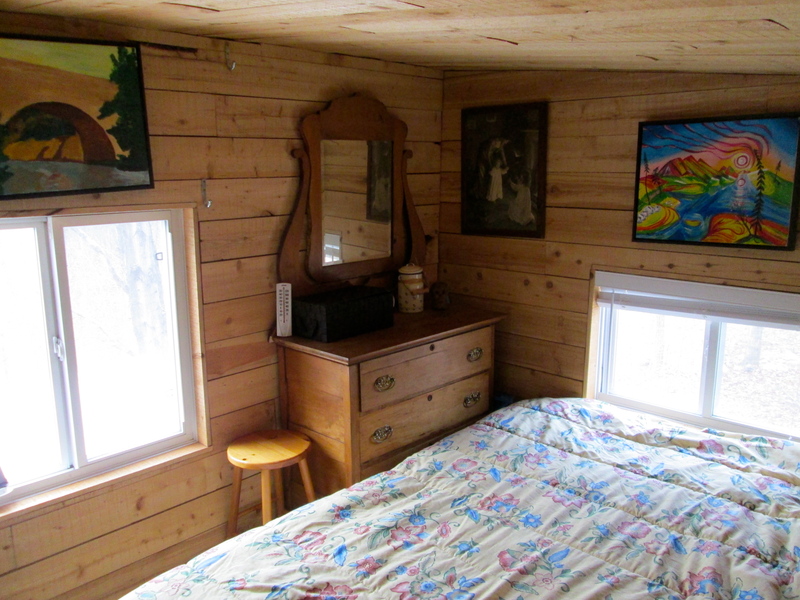 The woman, who came was very pleasant and I think she liked the tiny house which she referred to as a cabin. I disclosed everything to her about the house. No point in omission or in lying. We wait now to see if all will remain okay with respect to the house in the township where it is located. So far, while they knew what I was planning because I called them multiple times, I am unsure if they really know about me being there. For those of you who are just joining me here, you should know that as with most houses, Tiny House Ontario (or any tiny house) is in constant flux. I am not sure how it happens here. I very rarely buy new stuff, but I guess, I add more blankets as the weather gets cold and move the mats. This year, the big addition to the house was the stone patio and I also bought some horizontal blinds for some of the windows, when there was a sale on. It was not that I was trying to gain privacy from peeping chipmunks. Rather I thought it would be good to block out the sun in those windows that allow too much heat in during the summer months. Both of these improvements were felt and I am happy with them. The house is not finished, there is still no kitchen, no running water, no furnace and no modern bathroom facilities. There is much to be done in order to make it livable beyond the summer months. As it is, when I am here, I live in a sort of constant state of “glamping” – a form of camping involving accommodation and facilities more luxurious than those associated with traditional camping. Don’t misunderstand me, I don’t mind this. I actually love THO with all its little unrefined bits too. 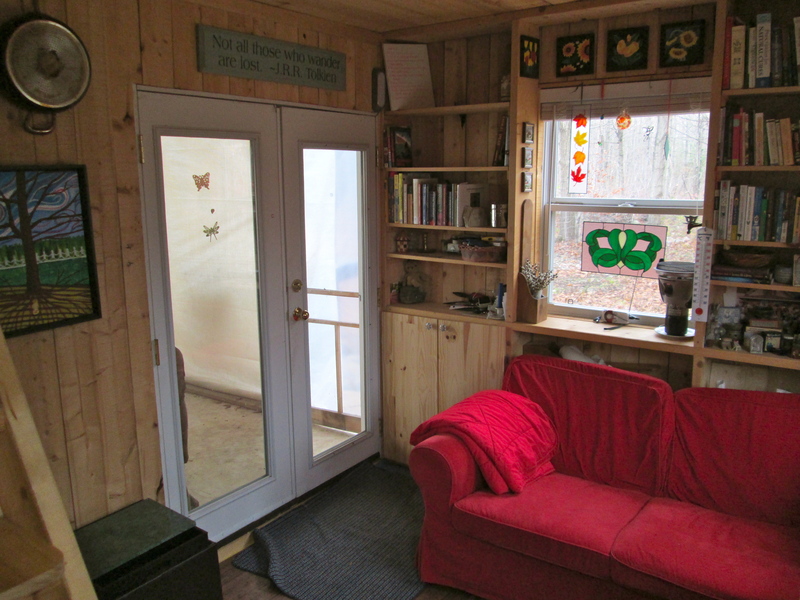 Even so, I do envision a few more comforts in my tiny house. What I mean to say is now MPAC has been here, so we will find out if the powers that be will allow this little sugar shack to stand and her vision be fulfilled. A reclaimed antique dresser to put away clothes in. I am sure a high dresser would offer more practical storage, but it would not be nearly as cute as this. I have a king sized bed in the loft. Actually it is two twins put together in the German style. This makes for a more comfortable sleep even on nights when one of us fidgets. This is the East side of the house. Do you see? There is rain barrel out there. This window gives me easy access to the spout. The curtained area is the closet, should you just now be looking at my the house for the first time. Dishes are drying inside. Due to the rain outside, they won’t dry on the porch. I did not get the kitchen put in this summer. I hoped I would earn a little more than I did with my art at the market, but this is the way that the cookie crumbles. When you are trying to support yourself and build a home using only creative earned budget, you can only do a little at a time. No debt gained, and I do have a wonderful now patio too! This green chair is where Hj likes to sit. I don’t want to air our dirty laundry… BUT in the spirit of sharing what works and what does not… I would like to pitch this chair because he consitantly tilts back in it. This blocks the way to the upstairs, the entry, and the bathroom. 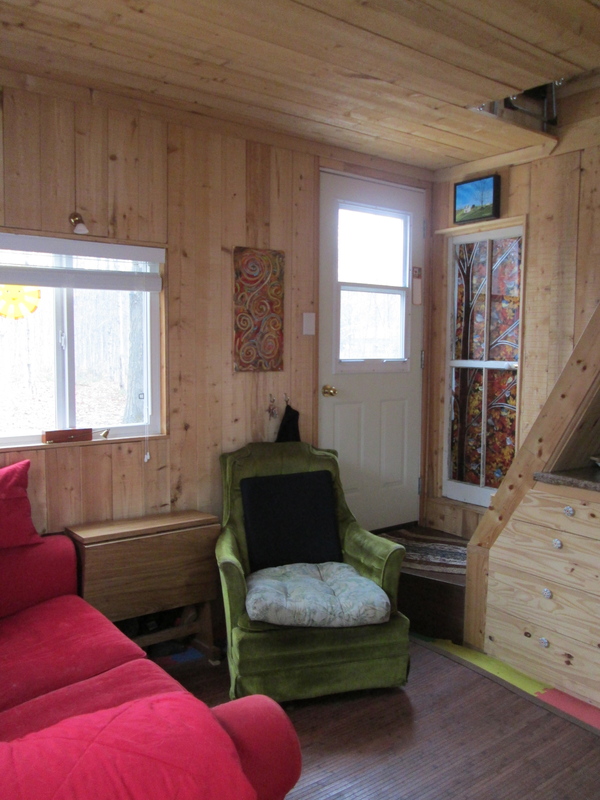 A tilting chair (recovered from the road side) is not the best solution for a tiny house, in my opinion. At least NOT in the “route” corner… Still, I like the chair, it has a funkiness about it and it is dead comfy. I worked on this painting over the past few days. It is a bit of a mystery as far as buildings go. 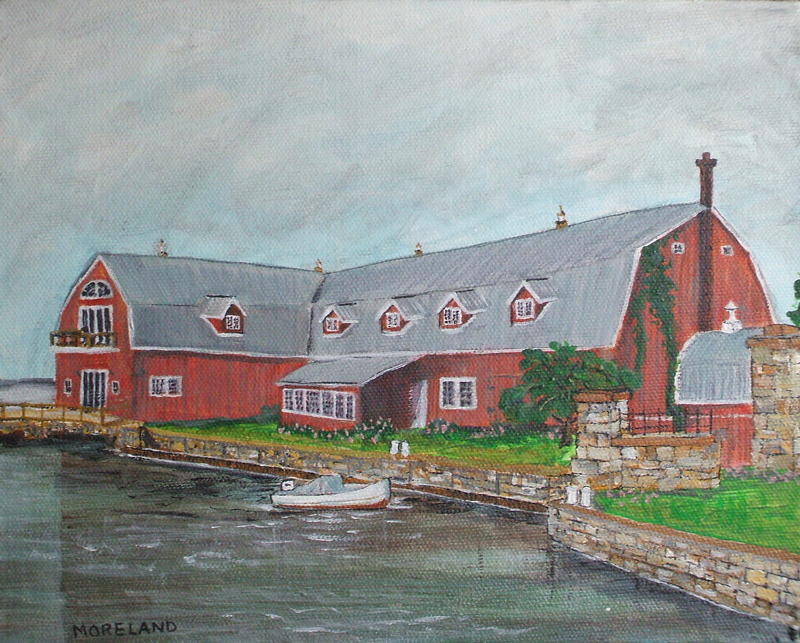 A huge barn right downtown on Kingston’s waterfront. No one seems to know what the building’s purpose serves, how long it has been there… If you know something about it, I would love to know. A few years ago I heard that a sail maker was housed there. But I am not sure if this is true. I finished this 8×10 yesterday.. This post is very removed from my Tiny House. It has to do with loss and change and Hamilton Ontario. Have a listen while you read please. Rap has to really speak to me lyrically for me to get it. The young singer Adam Lane, is from Hamilton, Ontario, close to where I stay when I am not at THO; I like the song because I am quite a runaway myself so I identified with it. I am not sure if he wrote the stuff because he does not give any details, but clearly it is about the need for change and he is talented. Speaking of rap, yesterday I saw a RAP van with a bunch of workers doing testing right down near where this video was shot. I guess, both kinds of rap have something to say about cleaning things up. I guess both these rappers are in some way wanting to see “Zero Discharge of Persistent Toxic Substances”… RAP I can really get into! The thing is, that Hamilton is changing a lot. There is a huge arts exodus from Toronto to Hamilton and this is clear on James Street North. Tonight I will head out to the monthly Art Crawl and see what is new in the changing and growing Steel Town. One of the newer artists to join the area is one I am loving! Check her out: Julia Veenstra. Clean up this dirty old town! I love the Art Crawl events, and I was looking forward, but now I don’t feel much like going anywhere at all… I think it is good to get up and off the computer, though… today has not been easy and I am (like so many millions of others) heavy in heart for my neighbours to the South. I want to acknowledge the horrible events today in Connecticut, but there are no words that can heal this wound. The only thing I can say is how sorry I am. My heart is heavy for those who were victims of profound loss today and so I posted to acknowledge not just suffering, but also to nod my head to those who recognize the need for change, healing and safe communities. I hope that from this horrible incident that at the very least there will come courageous change. My friend Colleen and I were chatting this morning, as we do from time to time. Our chats are filled with banter about animal ethics, environmental issues, and we also very often speak about the problematic ways in which human beings behave. There is often an emphasis on sheeplism and our frustrations in dealing with this. During our banter, she mentioned a song called The Trees which is both written and performed by the iconic Canadian rock band Rush. Since I have always been about as far away from the mainstream as possible, I had never heard this song. My loss. It is really great; meaningful on a lot of levels. The way that this song connected to something that has been on my mind for the last bit was timely. For the last few days I have been thinking a lot about the rules. Not the dating book series, but the rules of society. These rules, while put in place for the good of the whole, lost sight of a lot of things that are perfectly sensible. Specifically, I am speaking about Tiny Houses and the Bylaws that prohibit people from making choices that are better for the land, environment, mental health and in a million and one ways are greater than any McMansion can ever possibly be. I have for three days had the story on my mind about the fellow who bought some acres in the US and whose neighbour harassed him from the day that he moved there. 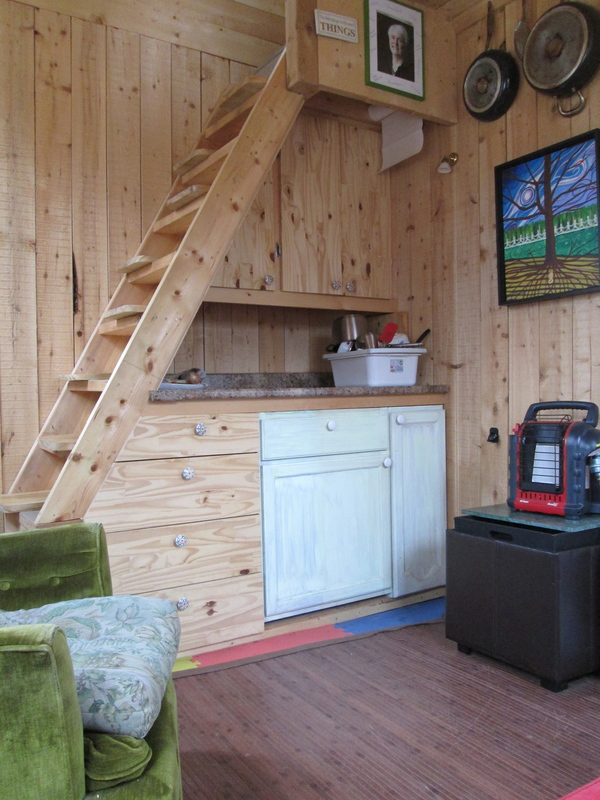 The story* messed up on so many levels, sort of Deliverance meets the Tiny House movement. The post is interesting but here is my synopsis of it this Deliverance story, the blogger bought land and put a tiny house on it. He hoped to live there for two years but made it only 5 months, in the time that he lived there he was constantly harassed and subjected to all sort of crazy from a weirdo next door (my words, not his). The question is, who would you rather have for a neighbour? A quiet person whose house is so small that you can’t see it and who leaves the land as natural as it was when the planet formed, or a lout who blares his music, lets his kid, big scary dogs and insanity into your life every day just because you happen to live next door? You guessed it, the lout called the government and they are making him remove his Tiny House from his land. 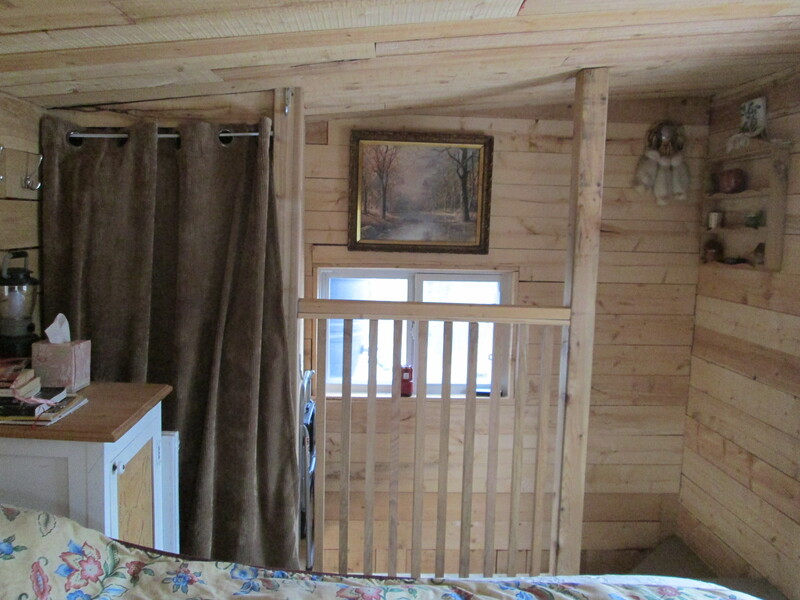 It seems wrong that an innocuous Tiny House can be considered wrong in anyone’s mind. I am of the opinion that the legality of Tiny Houses should not be questioned. This should not be an issue. If indeed laws are put in place to protect people then who exactly is this law protecting? Why would anyone think that a Tiny House is dangerous? Is this because refusing to participate in a consumer lifestyle is not acceptable and therefore a crime? Here are the wonderful lyrics to the song that I think speaks to this issue.